In today’s culture of increasing identity confusion, there is a need for believers to understand and model a healthy identity and purpose that is Christ-centered and kingdom-focused. When we know who we are, why we’re here and where we’re going, we will offer to the world a picture of what a true son and daughter of the kingdom looks like. Here are several principles that may help start the process in learning to know your true identity in the kingdom of God and fulfill your call and assignment. Determine to love Jesus more than anyone or anything. Simple? Yes. Easy? No. We become what we focus on – who we focus on. As we fix our eyes on Jesus and determine to please Him above all else, our hearts and affections will be rightly placed. In order to make wise choices and determine God’s will, loving Jesus first and most is foundational to everything else. We will never know who we really are apart from learning who Jesus really is. We are to be a reflection of Him. Walk in the Fear of the Lord, not the Fear of Man. Once we have settled to love Jesus most, we can expect to be tested in it. The Fear of the Lord keeps us faithful to His purposes even when others may misunderstand us, mock us or challenge us. Though I can walk with sensitivity towards people’s needs and perspectives, I don’t have to bow to them or change my beliefs for validation. Especially in the current atmosphere of hostility towards those who seek godly truth, we must guard ourselves from compromise at the altar of “acceptance”. Walking in a healthy Fear of the Lord provides wisdom, protection and confidence in all things eternal and right. Seek a reputation in heaven more than on the earth. In today’s social media, the more friends you have, the more tweets you post and the more “likes” you get, the more likely you are to draw a crowd. But getting attention is a lot different than having influence. Standing out in the crowd isn’t hard to do in our shock-driven, entertainment-saturated culture. What’s a lot more challenging is saying or doing something that will cause heaven to move on your behalf to change entire cities and even nations. Sometimes those in the secret place are changing history a lot more than those in the public eye. Seek to move heaven first and then watch the earth respond. Know your spiritual gifts. You have been given a measure of spiritual gifts that have marked you from creation. The seven gifts listed in Romans 12:3-8 point to the motivations and passions your Heavenly Father put within you from birth: Prophesying, Serving, Teaching, Exhorting, Giving, Leading, and Showing Mercy. When you can identify your primary “motivational gift”, you can better know your strengths and weaknesses and where you best fit in the body of Christ. Though these gifts do not necessarily define who you are, they do point to what you’re good at and what will bear the most fruit in your life. Know your call. Where your spiritual gifts explain your primary motivation, your calling is what you were born for, or better yet, who you were born for. God’s priority is always people and our calling will be a reflection of His heart to reach someone. This may take a lifetime to fulfill, but you will know it is His call because it continues to burn in your heart, keep you up at night and never quite goes away regardless of challenges or set-backs. It will require faith and be bigger than you are, but your call is what draws your heart and inspires your journey. Know your present assignment. If your life story were written, your calling would be the entire book. The writing style and illustrations would reflect your spiritual gifts and your assignments would be the individual chapters. Seasons and priorities change. Specific assignments come and go as ways to not only to mature you, but to increasingly reveal God’s heart in and through you. Assignments serve to advance the kingdom and increase the measure of grace on your life to ultimately fulfill your call. Some may seem like side roads to your destination but all will lead to His purposes as you trust His heart in knowing how to prepare and equip you. Measure your success by the fruit. Regardless of our call, gifts and assignments, the true measure of success will be in the fruit that follows us. If we are walking in the fullness of our identity, the people around us will recognize it, grow from it and encounter Christ through it. God’s grace will flow out of us and will exponentially increase in those around us. Look for disciples, not just “followers”. Look for reproduction, not just reputation. Look for transformation that lasts, not just a buzz that quickly fades. 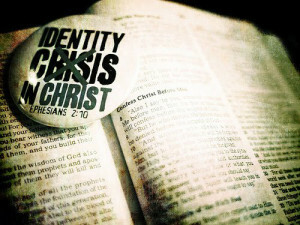 Ultimately, knowing who you are is not about “finding yourself”, but losing yourself in order to find Christ. Seek to know His heart above your own and trust His plans in molding and shaping your life to be a perfect representation of Him. There won’t be any identity confusion. In the end, the world won’t see you anyways – just Him.